The beautiful sandy beaches are not all that the North Carolina coast has to offer visitors. 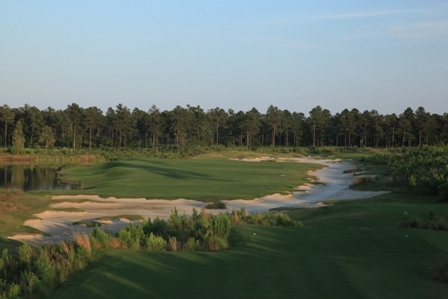 There are also several “must-play” golf courses in North Carolina – including Cape Fear National– coastal North Carolina’s newest golf destination. Brunswick Forest’s own Cape Fear National Golf Course offers 18-holes of challenging golf set amongst a beautiful coastal North Carolina pine forest. An ideal course for golfers of all levels, Cape Fear National was recently named one of Golfweek Magazine’s “Top 10 Best Courses You Can Play in NC 2012,” making it one of the most desirable golf courses in North Carolina. Before hitting the course, golfers can test their chipping and putting skills on the practice greens. Then, they can head to the driving range to take a few swings before teeing off. After a round of 18 holes under the glorious North Carolina sun, golfers can end their day on a high note at Cape Fear National’s very own restaurant, The Forest, for a bite to eat or a few celebratory drinks. Golfing on the North Carolina Coast is a great way to spend a day. Whether you’re just in town for a vacation, or have decided to take up residency here, once you’ve played our spectacular golf course, you’re sure to keep coming back to Cape Fear National.